 Autry (Love and Profit, 1991) is back in the saddle again, astride different--if by no means fresh--hobbyhorses. Now retired from the presidency of Meredith's Magazine Group (a position that allowed him to extol trendy, vaguely New Age management precepts), the author has moved on to address larger matters, including life its own self, in another mawkish amalgam of short-take commentary and banal verse. 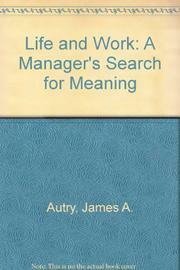 In deadly earnest fashion (which suggests that, if he were a monarch, Autry would very much like to be known as James the Good), the erstwhile executive offers scattershot counsel on integrating one's personal and professional lives, among other things, in letters to fictive offspring. He also touches without dwelling on such issues as what business can (or can't) do to help solve socioeconomic problems, the putatively excessive compensation of top corporate officers, the responsibilities of stewardship, dealing with loss, encouraging a sense of community in varied milieus, health care's costs, and the ubiquity of pop culture. Nor does Autry neglect to provide sanctimonious apologias for his former insensitivity to the aspirations of women, members of ethnic minorities, the disabled, and others who qualify in one way or another as disadvantaged. In some cases, the author's unexceptionable sensibilities yield decidedly loopy results. At one point, for instance, he argues that the optically challenged should reflect whether they could do their jobs without the ``assistive technology'' afforded by eyeglasses. Featherweight inspirational fare for those who find Og Mandino too demanding.